It can be very frustrating when you go out and buy your cat a scratching post but they continue to scratch the furniture. "Why won't my cat use their scratching post!?" I hear you cry. So... how do you encourage your cat to use their scratching post? 1. Start during kittenhood. Of course, this tip may be a little redundant for some, unless you have a time-machine, but it is best to introduce your cat to their scratching post while they are still a kitten, or as young as possible. It's much easier to teach a desirable behaviour from the beginning, rather than try to modify an undesirable behaviour later on. 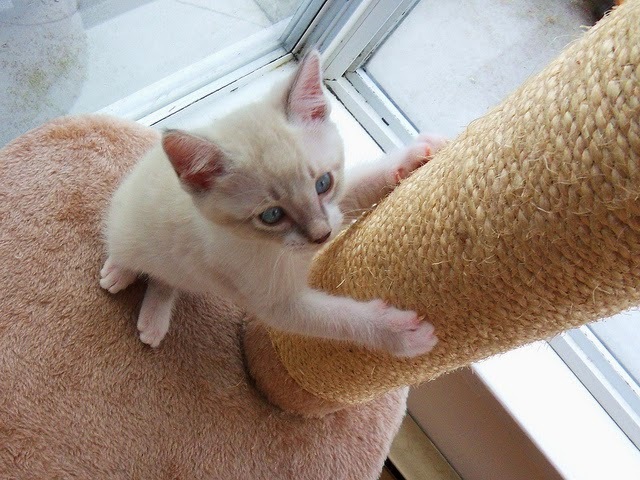 Since cats often stick with the same scratching object, when taking a new cat or kitten home it may also be a good idea to kindly ask to take the scratching post they are currently using as well, if it is appropriate to do so. It will also serve as a familiar object for them to have in their new home. 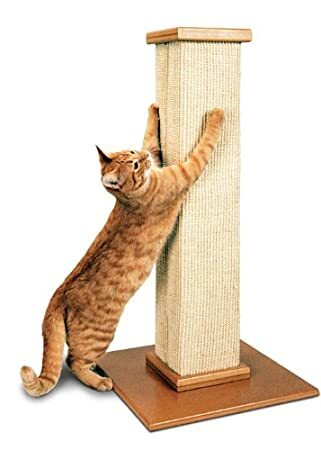 The SmartCat Ultimate Scratching Post is the perfect scratching post. to see 5-star reviews go to Amazon. 3. Make sure the post is secure. Is the scratching post sturdy or does it move around when they use it? Either secure the scratching post down, buy one with a sturdy base or buy one that is large and heavy enough to not move when they use it. Not many cats will enjoy using a scratching post that doesn't offer them any resistance when they use it and just wobbles around. Sisal and corrugated cardboard tend to be the most popular choices amongst the feline community. Some behaviourists also discourage using carpet posts as they believe it can be confusing for the cat. However, each circumstance is unique and every cat is an individual and will have their own personal preference. Perhaps your cat doesn't like the texture you have chosen for them and they would prefer to try something new. 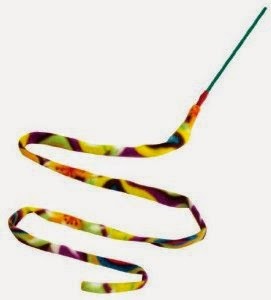 toy and is a popular 5-star item on Amazon. for cats who love angles. This is a popular 5-star item on Amazon. 6. Imitate what they are currently scratching. If you are not sure what scratching post your cat would prefer then try to imitate what they are currently choosing to scratch. Pay attention to what texture and angle they seem to prefer. If they like to scratch the carpet you could try a horizontal scratcher, or if they prefer to scratch the walls, you could try a vertical scratcher. 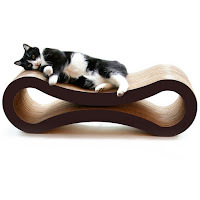 The SmartCat Bootsie's Scratcher is a brilliant invention as it's angle can be varied according to your cat's preferences and either be laid flat on the floor or rested against the wall. 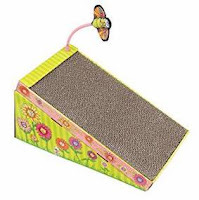 The SmartCat Bootsie's Scratcher is high-quality and affordable. 7. The '1 each plus 1' rule. 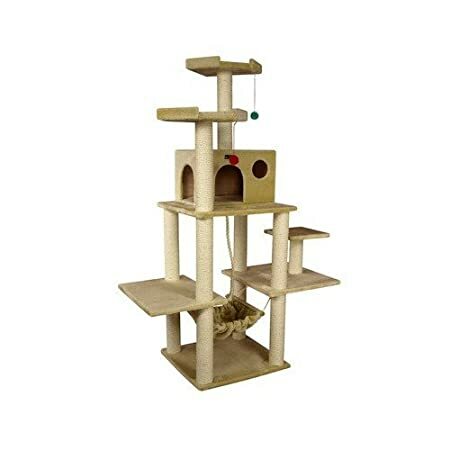 For every cat you have in your home you should have one scratching post, then you should have an extra scratching post on top of that. Scratching is a way of cats marking their territory in order for them to feel secure. If there is only one post and it has already been marked by one of your cats, the others may not use it and will choose to mark other places in the house instead, such as your sofa. 8. Placement is key. One of the reasons a cat scratches is because they are marking their territory, therefore don't hide scratching posts out of the way, not at first anyway. They need to be in more prominent locations so, for now, place them in the spots where they are currently choosing to scratch. You can move them somewhere more discrete once they are consistently using them. Also, do they have a spot where they like to nap? You can put a scratching post there too as cats often like to have a scratch when they wake up from a snooze. Another good location to try is next to the door that leads outside as it may be perceived as territory boundary. 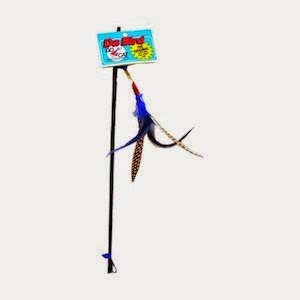 You can also try using fishing-rod-type cat toys, such as the Cat Charmer or Da Bird, to play with them on and around the scratching post. Encourage them to pounce on the toy so that their claws land on the post. They'll soon realise how good it feels to sink their claws into. Whenever they are using their scratching post tell them what a good kitty they are! 10. Rub their paws on their scratching post. As long as doing so doesn't upset your cat, you can gently rub their paws on their post while giving them lots of praise. The main benefit of doing this is that it leaves some of the secretions from their paw scent glands on the post, which will hopefully encourage them to scratch it next time they get the scratching urge. BONUS TIP! Please read how to stop your cat from scratching the furniture or carpet if you need tips on how to protect your home from sharp claws while your cat is in the process of learning to use their scratching post. Thanks, now I realize how silly I look by scratching the post myself to show her! I've been doing this myself. My nails look good but that's about the only positive result from me acting like a fool. To be fair that's how I trained my dog to ring the doorbell when he needs out! I'd lift his paw and ring it and he eventually learned. Thought that the same principle would apply to my cat but no. She just doesn't get it. I also don't think she's very smart to be honest, which doesn't help when I'm trying to train her! I just did the same thing! Tried to show our new cat how to use the scratching post. Thanks for the very helpful, practical tips. That was really useful, thank you. I definitely need a nice big sturdy scratching post, and perhaps one of those fishing rod toys. I have hope again! Sadly none of these methods work with my new cat. He's about 6 yrs old, lived with one human his whole life, who I know nothing about. He's friendly and sweet and loves the whole family but absolutely avoids all scratching posts regardless of material, texture, location, or position (flat vs vertical). He will only scratch furniture, it's almost like he was trained to scratch furniture and to avoid all actual scratching posts. Catnip, treats, and toys have all failed as he avoids these things when they're on a scratching post. Any advice? We're going on three weeks and if we can't get him using a post soon he'll have to go back to the shelter. It can certainly be hard to break a habit that has been going on for 6 years, but it is not impossible. My advice to you would be to think 'baby steps' and 'short positive interactions'. For example, if he doesn't like taking treats off the post or playing on the post, then start of by doing it next to the post. Get the yummiest treats you can find (such as tuna that has been warmed in the microwave so that it is extra smelly) and slowly entice him next to the scratching post and the eventually onto the scratching post. Get a fishing-rod-type toy and play with him around the post, when he is lost in the moment gradually bring him onto the post. Is he scared of the post or just not interested? Is the post big and sturdy? Make sure that you stay relaxed yourself and don't get irritated or tense. He will sense that something is not right. Have you read my post on how to stop a cat scratching the furniture? I recommend that you read both posts and combine the information. It will help save your furniture in the mean time. Please let me know how your progress goes, if he stays the same or gets better. I will do what I can to help as it would be such as shame to see him go back to the shelter. Try not to put a time-limit on it as this just adds extra pressure/frustration to the situation. We sprayed post with catnip oil, coated it with catnip, Our 14 year old cat curls up atbase of post aand sleeps. Unfortunately, none of these methods (which are quite similar to what everyone else is saying) are working. My cat is not afraid of the scratching post, he just doesn't use it. He uses the couch and the chair, and I yell at him, pick him up and place him in front of the post and puts his paws on it. I release his paws and he just puts them back on the floor. I'm worried about his health, and the rest of the family wants to declaw him but I don't want to. I put my cat's toy on top of the scratching post, and sometimes he puts his claws in to grab the toy. I cannot afford to continuously buy posts until we find one for him, and he seemed to like the carpet so we made his post out of it. He doesn't like treats, nor does he seem interested in catnip. Please help, I've tried everything and to no avail. Thanks. Please don't declaw your cat no matter what anyone says. It's cruel and painful for the cat and will cause other problems like biting and not using the litter box. Please please try anything else just do not declaw your cat. I took in a stray cat which the vet estimated her age to be about 1 year. I have 3 cats and multiple scratch posts four to be exact. Different rooms different levels of the house. The stray cat who I have had 4-5 months refuses to use any. Instead she is ruining my wood. She will stretch and scratch up in the windows. She ruined all the wood on my dresser mirror. She stands on top of kitchen counter and scratches cabinet doors. She is scratching in extremely high areas. She also stands and stretches to reach top of doors. I never had a cat do anything other than furniture. All my other cats use their scratching posts daily and new cat sees them so I would think she would imitate them but no. I have carpet post, sisal posts, and a carpet post. 2 are 3 feet high. 1 is 4 foot high and 1 is 6 foot high. What do you advise? Hi there, I think it is excellent that you have taken on a stray cat but of course, as you know, you have work ahead of you as she is used to being able to scratch whatever she wants. Please read my article on how to stop your cat scratching the furniture for tips on how to protect your furniture while she is still learning (http://www.katespetcorner.com/2013/08/how-to-stop-cat-from-scratching.html), for example, shake a can of coins if you catch her in the act of scratching what she should not be; use double-sided sticky tape, aluminium foil and clear vinyl sheet to protect your furniture; use deterrent sprays and odour eliminator sprays where she is currently scratching; and keep her claws trimmed and even consider soft paws if things don't improve (all explained in my other article). Make sure you get fishing-rod-type toys and while playing encourage her to land on the scratching posts, and tell her what a good girl she is. Of course you can put cat nip on the posts to peak her interest. Have you tried putting a post next to where she naps as cats often have a scratch upon waking up? I have 2 two year old birmans,they have always used a scratch post but they wont use a new one...I have purchased 3 different ones,all still in the house but they will only use the old worn out one.any ideas?i don't really want to get rid of old one in case they use my furniture instead! Hi there, are the new posts quite similar to the old one and placed in a similar position? I certainly wouldn't throw out the old one if that is what they are using. Could you re-cover the old post with new sisal/carpet? Keep trying all the tricks to peak their interest in the new post, such as cat nip, treats and fishing-rod-type toys (all explained above). Please let me know if any of that helps and if you need further assistance. After several months of trying new scratch posts, I made an appointment to have her nails cut, and I'm having caps put on her claws. Even tho I wouldn't have her declawed, I still read up on the procedure...it's beyond cruel and can change her personality as well as lead to infections. Makes me wonder if people know that they take off the first knuckle on each toe. Such a barbaric, awful thing to do to a pet. My cat is a rescue and is 16 months old..she likes to scratch carpet so it's not really a big issue. Our three cats love the scratching post (sisal rope) and a corrugated cardboard tray. The biggest problem is that the cardboard shreds and gets all over the rug and house. They are worn through in a week or two. I tried a flat pad that had some sort of woven material on it, but the three cats aren't interested in it even with catnip on it. 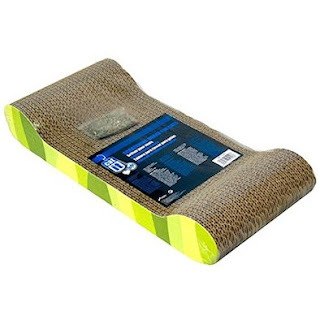 Is there any sisal rope flat scratching pads? If you don't like the look of those I would suggest a DIY project for yourself and to make one! I have two cats. I had two scratching posts -- one of them decided that one belonged to him but is possessive of both. I got rid of the scratching post neither of them liked and have tried to give the post-less cat exclusive access to the new one. He loves it, but whenever his brother sees it, he also wants in on the action. Do you have any tips to insure that the post-less cat gets to keep his new scratching post for himself? Hi.. I just adopted a 4 year old cat from a rescue. The cat was a stray for about 2+ years. He's very sweet, but is also starting to use furniture and anything else he can find to scratch on. I have a large multi sisal cat tree and a diagonal card board one. He has no interest. I tried sprinkling cat nip, but he has no interest in that either! I think because he was a stray he doesn't know what it is? He doesn't play with toys either. I'm not sure whAt to do.. I will try your approaches in protecting my furniture, but how do I get him to use the scratchers! Since your cat is still young, it's best to slowly introduce these toys. Train the cat into getting used to all the toys. Try not to give your cat too much catnip as they can get addicted to it, I always refer to catnip as the 'cats drug'. Is your cat scared of them? 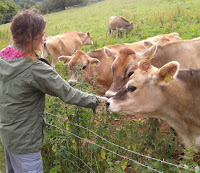 It's always good to slowly introduce them as I mentioned earlier. Give the cat some time and try luring her to it. Is your cat playful? A playful cat will always enjoy a scratch or two! Catnip can help getting your cat active, but as I said; don't use it too often. Is your cat used to it's surroundings? Your cat may be frightened because of the area it's in! Let the feline settle in completely. None of those tips help. None. Not helpful at all. And i only have trouble with male cats. If you tried all of these tips and none of them helped you then you should contact a professional behaviourist to come and assess your situation. There may be underlying stressors causing the marking behaviour, these can range from too many cats, outsider cats coming into their territory, bringing new cats into your home or major changes in their environment. A thorough history of your situation would need to be taken by a professional and it may be a lengthy process that requires a lot of commitment to resolve the issue, far more than I can cover in my article. Good luck.